Now that my Expedit bookcase is all assembled, it's time for the fun part! 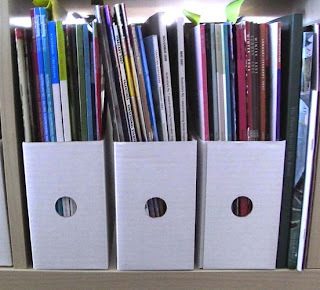 I bought some magazine holders for those magazines which just seem to multiply all by themselves. I'm not sure how I've come to have so many (this is only a small part of the collection) but I hate parting with them. I love sitting down with a cuppa, flicking through a magazine and enjoying the eye candy! But at some point, I will have to pare down that collection. For the time being though, they look tidy and they're more or less organised! 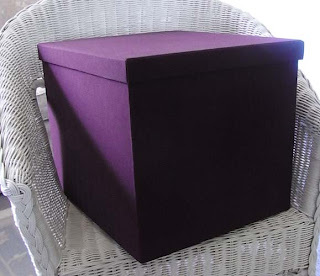 I added a couple of Strikt magazine boxes for deep storage in a gorgeous burgundy colour. My studio currently has cornflower-blue walls so I'm not sure why I chose burgundy boxes but I do like the colour, just not with the blue walls. These boxes are really deep and house my collection of patterned serviettes. I've stacked them vertically inside the box so it's easy to slide the packets in or out, without having to rifle through the whole box. 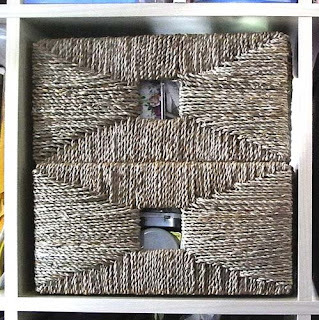 The box is deep enough for a second layer, so I'm looking for a basket with handles that I can lift out to get to the contents below. And I also picked up a couple of Knipsa baskets. These are quite sturdy because of their wire frame and so they're able to be stacked on top of each other and two stack nicely in each cubby. My tin collection fits nicely in here! The beauty of all these Ikea products is that they fit inside the Expedit shelves so they're neat and tidy. 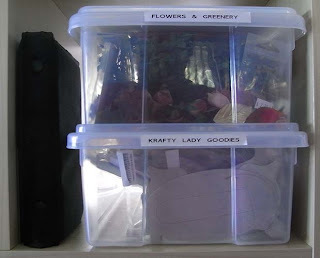 But then I discovered that the Starmaid 10 litre plastic bins fit quite well in the shelves too. And they have the added bonus of being clear so I can see the contents. These are relatively inexpensive (depending on where you buy them from). I picked them up at Big W but they're also available at other variety stores and I've seen them at my local hardware store too. And once again, they stack neatly on top of each other. I still need more storage (probably another Expedit shelf or two!) but this has really helped to sort some of the clutter in my studio - no more stepping over the piles on the floor!